Some people look at buildings and see them for what they are, and some look and see what they can be. Thus, the concept of converted houses was born, converting unconventional structures into weird homes. To design lovers, nothing is more fascinating than a building with an unusual history. Transforming one unique building into another is something that brilliant architects excel at. Truly imaginative architects can preserve the original character and design of the original buildings and still add their personal unique touch to the converted houses they build to become very weird homes indeed! From old dairies to water towers, any building can be reused for dwelling purposes if you have the vision to do so. Join us for this architectural journey as we take a look at the weirdest homes created from the most unusual converted houses. 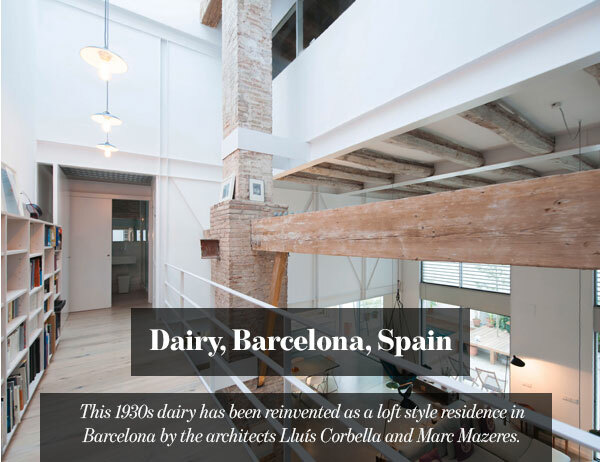 This 1930s dairy has been reinvented as a loft style residence in Barcelona by the architects Lluís Corbella and Marc Mazeres. Some new metal beams, glass walls, and a suspended walkway create a series of airy spaces around the house. However, the house keeps the original facades, roof, ceiling beams, as well as the brick pillar at the heart of the home. Owner Leigh Osborne bought the building for £380,000, and spent almost £2million converting it from a Victorian water tower into a family home. 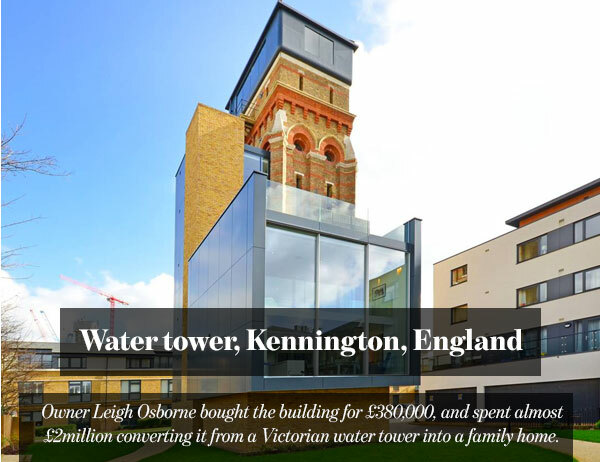 In the 10 years leading up to the purchase of the water tower, Leigh had bought, renovated and sold 40 properties in London. The water tower was his biggest project though. The nine storey tower offers 360 degree views across London, it also features the largest sliding doors in the UK, and a huge water tank. A two-storey extension with a large glass façade was also added At the base of the tower. The original water tower had been built in 1877 to serve the adjacent Lambeth Workhouse, but it has been empty and unused for years. The original building was completed in 1955 in a breath taking place. It had served for many years as a storage space after it was no longer used to hold well water. 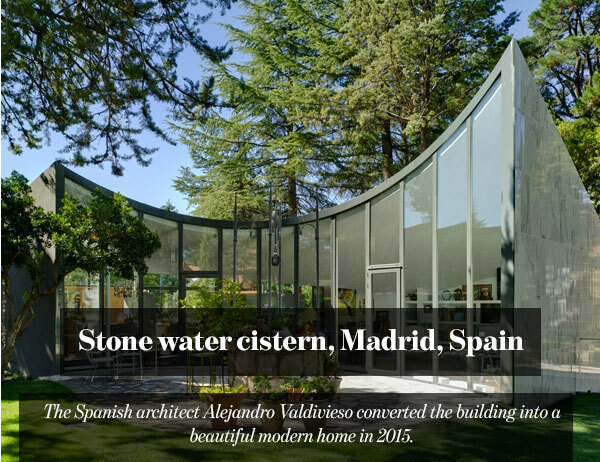 The Spanish architect Alejandro Valdivieso converted the building into a beautiful modern home in 2015. The architect converted the top floor of the cistern into an open plan living area that contains the kitchen, living room, and dining area. The living space features a marvelous glass wall that follows the curve of the original well which was left intact in the courtyard. The old stone cistern, which lies in the lower level, houses the bedrooms and bathrooms. 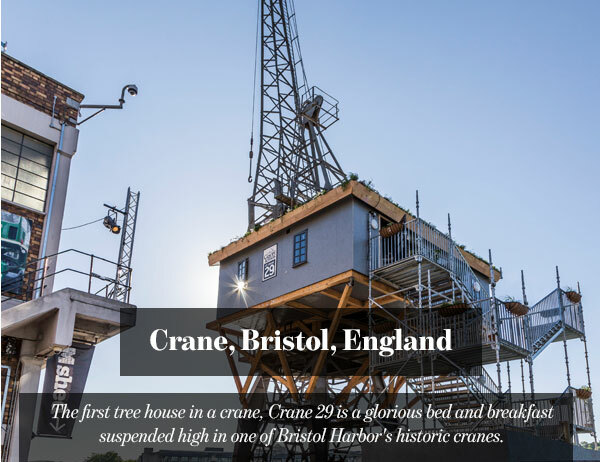 The first tree house in a crane, Crane 29 is a glorious bed and breakfast suspended high in one of Bristol Harbor’s historic cranes. The house was built by Canopy & Stars, a company that specializes in holiday experiences in the great outdoors. The house provides the goodness of the outdoors in a cozy cocoon of calm in the heart of the city, with perfect views and a true natural high. The tree house also offers a rustic earthy interior full of green plants, and is fully equipped with everything including electricity and even a shower. The sad news though is that it will only be available until September 24th,2017. All profits from the B&B will be donated to Friends of the Earth. 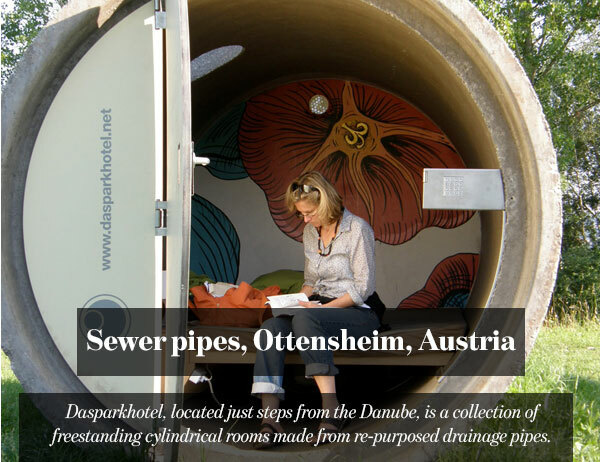 Dasparkhotel, located just steps from the Danube, is a collection of freestanding cylindrical rooms made from re-purposed drainage pipes. The exterior is very simple while the interior of the rooms are surprisingly cozy and comfortable. Located in a public park, the highly unusual lodging was originally built by designer Andreas Strauss in 2004 using sewer pipes. This weird hotel is open from May to October every year and operates on a pay-as-you-wish basis. 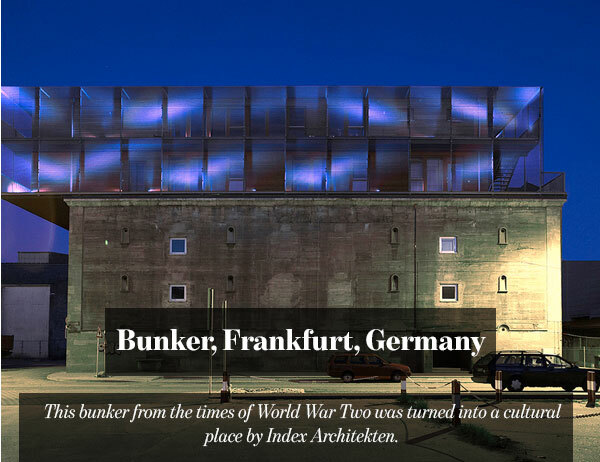 This bunker from the times of World War Two was turned into a cultural place by Index Architekten. A carefully calculated wooden box was set on top of the bunker, harboring artists’ studios and the Institute for New Media. The studios are pushed to the center, and all the public space has been pulled to the exterior, creating a view of the city from public areas. Inside the heavy concrete core, studios for musicians to exercise were installed. If you get the chance, would you live in one of these weird homes?